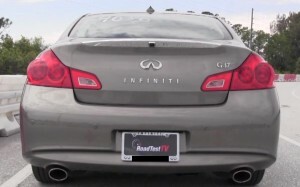 We were surprised (more on that below)……Under the hood of the 2013 Infiniti G37 is a 3.7-liter V6 which allegedly makes 328 horsepower and 269 pound-feet of torque (We firmly believe it is underrated – see below). The base transmission on the entry level G37 Journey and all-wheel drive G37X is a seven-speed automatic. A six-speed manual is standard on the G37 Sport. Most testing we have seen on this vehicle indicate it is a stout performer that is capable of going from zero to 60 mph in 5.4 seconds. EPA-estimated fuel economy for the G37 Journey is 19 mpg city/27 mpg highway and 22 combined; 18/25/20 for the G37x and 17/25/20 for the G37 Sport. Recently, we had the opportunity to test a 2013 G37. Our G37 was a Journey model with the Premium package (sunroof, Bose radio, etc). The first thing we noticed when we turned off the traction control was that the G37 would burn the tires all the way through first gear. That was our first surprise. Our next surprise came at the drag strip when our test G37 Journey ripped to 60 mph (V-Box) in 4.7 seconds, and lit up the 1/4 mile in 13.09 seconds at over 106 mph (Video Below). That said; considering the performance of this modestly priced luxury sedan, a G37 may bring a tear to the eye of a V8 muscle car owner if they are not careful.